A-DOG might sound a bit like a new musician, but it's actually a nonprofit that offers workshops, recreation advocacy and community building ...for dog owners. The Arlington Dog Owners Group was founded in 2008 by a group of residents who were trying to get off-leash recreation in the Boston suburb. Along with former members of the defunct Friends of Canine Companions of Arlington (some of who helped found A-DOG), the organization supported a new bylaw that went into effect in fall 2010. The long process resulted in responsible dog owners being able to have their dogs off-leash until 9 am in 14 Arlington parks. 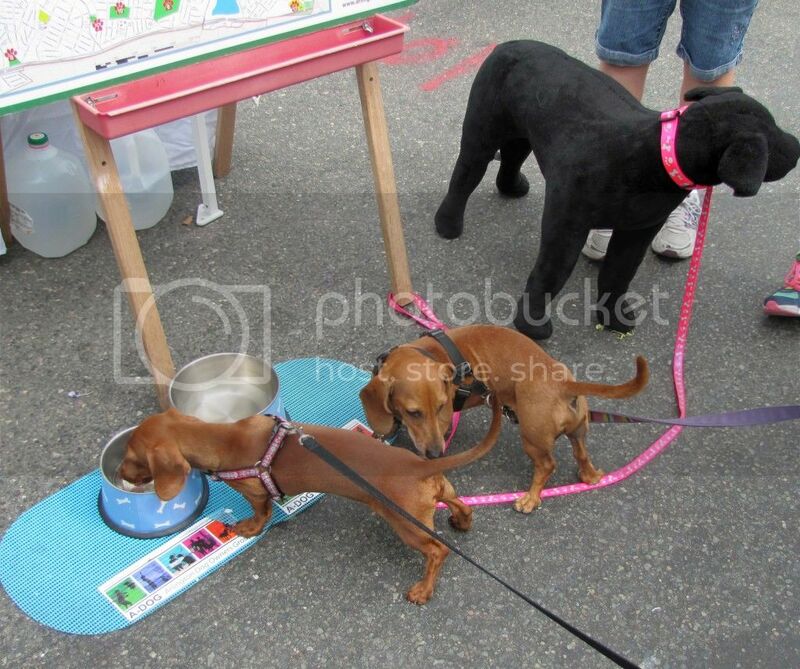 Two dachshunds and a furry friend enjoying the water bowls at A-DOG's Town Day 2014 booth in Arlington, Mass. "The idea is that early in the morning, when a lot of the people in the parks are dog owners anyway, we have this little window," said Sue Doctrow, president and one of the founding members of A-DOG. "What we're doing is providing opportunities for responsible dog owners' [dogs] to play, to meet and have the owners exercise their dogs and be social." A-DOG played a key role in creating another opportunity for exercise and socialization at Thorndike Off-Leash Recreation Area in Thorndike Park. Before the dog park opened in May 2012, fenced dog parks were legally allowed in the city thanks to a bylaw written by A-DOG founding member and Vice President Rosyln Smith. But none had been established yet. Doctrow, who moved to Arlington in 2003, collaborated with other members and people who had previously been working on the project. "After we formed A-DOG, we asked the town to form a task force that could investigate where fenced dog parks could be placed," she said. "In the meantime, the Stanton Foundation contacted the town of Arlington and asked if we wanted a dog park. The timing was great." 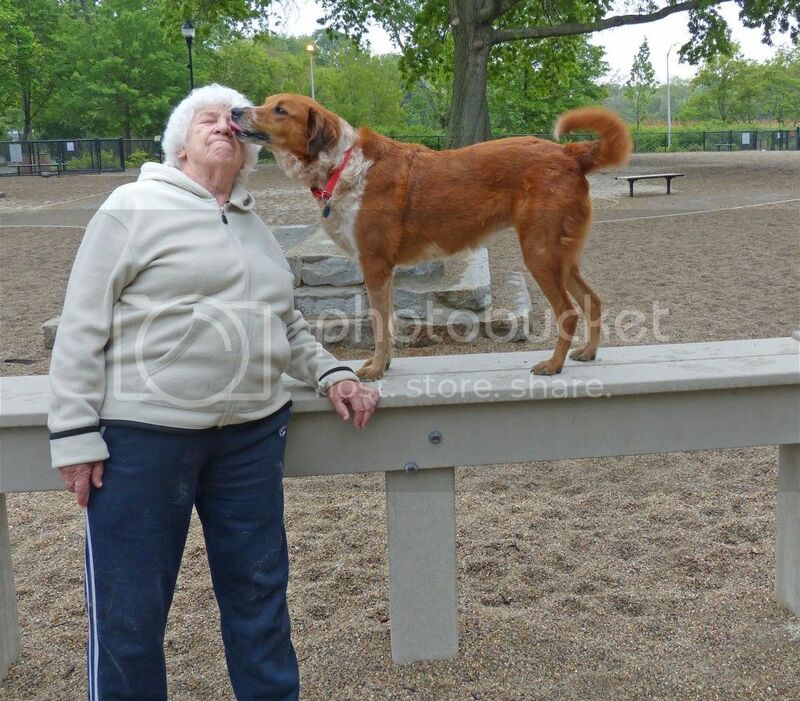 A dog and dog owner at Thorndike Dog Park in Arlington, Mass. The foundation's grant paid for 90 percent of the dog park and the city paid for the rest. A-DOG volunteers helped support the efforts by organizing a Friends of Thorndike Dog Park group, and promoting support via their Facebook page and word of mouth. The end result is a generously sized $250,000 dog park complete with agility equipment, a separate fenced area for smaller dogs, a supply of dog waste bags donated by the local Petco Unleashed, and awards -- Boston magazine's Best Dog Park in 2012 and BringFido's Top 10 Off-Leash Dog Parks in Massachusetts. Doctrow said that owning her two rescue labs, Candace and Becker, has helped create a new sense of community. She advises dog owners to, "get to the dog park and get to know people because it's a really nice way to build community. I have so many great friends that my husband and I met through our dogs, and a lot of people report that." 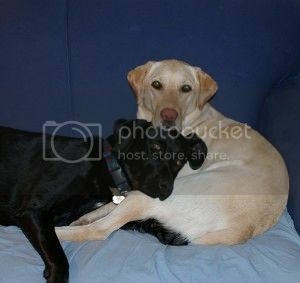 Sue Doctrow's two rescue labs, Candace and Becker. Currently A-DOG has about 500 members and the group offers two types of memberships: full membership at $20 for one year or $35 for two years, or associate membership, which is free. Full members receive a membership card and a discount at local "Friends of A-DOG" businesses; all members and nonmembers who sign-up receive the group's newsletter. "We really like to be inclusive. We need some of the dues to maintain our operations and do the things we want to do," said Doctrow. Part of that inclusiveness means people don't need to be Arlington residents to join A-DOG or use the Thorndike Dog Park, which is not always the case at other dog parks. 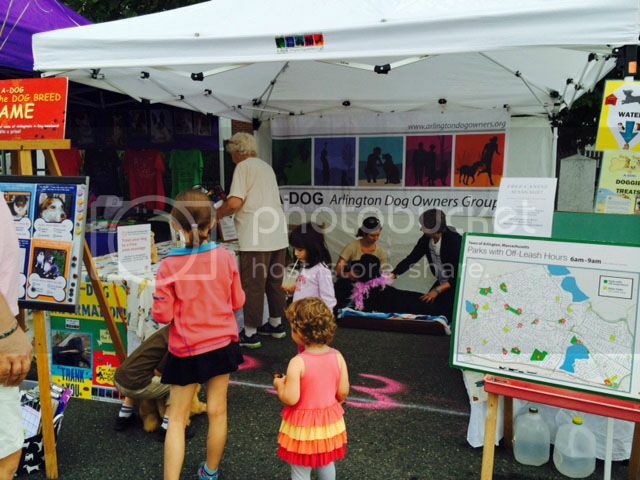 A-DOG's Town Day 2014 booth in action. Some of the events that A-DOG members and their dogs can participate in are the Arlington Patriots Day Parade, the group's booth at the city's Town Day festival, a summer wine tasting (dogs need to bring their ID to drink) and a variety of workshops, including a recent pet first-aid and CPR basics class and a panel on therapy dogs -- after which several members got their dogs certified and are now making therapy visits to local organizations and people. Doctrow emphasizes the fact that A-DOG is a collaborative group where many people volunteer their time to support the goals, and help educate its members and the community. "I think most of the people like the community. Dogs bring community and people want to strengthen those ties. And the bottom line is, it's fun. We keep reminding ourselves of that when we discuss the goals, the organization: It's about fun!" You can learn more about A-DOG by visiting them online at www.arlingtondogowners.org here. The Friends of Thorndike Dog Park Facebook Page is here. The lede for this story was written in part by Tiffany Raiford.